There are some things in life that are guaranteed to make me smile. Georgia Bulldog victories are on that list, of course, and I also relish occasional moments of glory on the softball field. Shifting to the world of public policy, nothing warms my heart and brings a smile to my face faster than news that taxpayers have successfully escaped the greedy and grasping claws of government. I cheered when successful French taxpayers moved across the border when Francois Hollande imposed a 75 percent class-warfare tax rate. And I was overjoyed when elitist French politicians whined that the geese with the golden eggs were escaping. I was happy to learn about consumers traveling across borders to escape punitive air-travel taxes in places such as England and the Netherlands. I applauded when Toyota moved hundreds of jobs from high-tax California to low-tax Texas. And when oppressed taxpayers successfully escaped from New Jersey. Or from Detroit. I also was glad to find out that Americans can dramatically reduce their tax bills by moving to Puerto Rico, which is a completely legal tax haven for U.S. citizens. I’m even happy when American companies use “inversions” to get out from under America’s insanely punitive approach to business taxation. I’ll also defend individual Americans who reluctantly give up their passports to protect themselves from confiscatory taxation. The common theme in all these examples is that politicians were unable to seize as much money as they hoped because taxpayers had the ability to shift economic activity to jurisdictions with better policy. But I’m guilty of digressing. Today, we simply want to focus on good news. And I know this Bloomberg story made me feel all warm and fuzzy. Here are some excerpts about the looming decision of at least one bank to escape excessive English taxes. HSBC, Europe’s largest bank, has faced calls to move its domicile away from the British capital after the government increased the levy on bank’s balance sheets for an eighth time this year. HSBC is hit the hardest by the tax and paid 750 million pounds ($1.1 billion) last year. Both the Labour and Conservative parties have pledged a more onerous tax regime for banks in their manifestos for the May 7 U.K. election. “Banks and pay are still easy cannon fodder for politicians,” said Jonathan Tyce, senior banks analyst at Bloomberg Intelligence in London. “The lines between the Labour and Conservative parties are more blurred than usual and either way, it doesn’t look promising for banks or bankers.” …Standard Chartered Plc, another British bank that like HSBC makes most of its profit in Asia, is also being urged by Aberdeen Asset Management Plc, its second-largest shareholder, to relocate to Asia because of the cost of being in London. Good. I hope both banks leave. While I have grudgingly admitted that David Cameron’s government has done a decent job of restraining spending in recent years, taxpayers haven’t reaped many dividends. Yes, there have been some very successful reductions in the corporate tax rate and a modest reduction in the top tax rate on personal income, but these reforms were more than offset by big tax hikes when Cameron first took power. P.S. If I understand correctly, HSBC didn’t get a bailout during the financial crisis. But if I’m wrong and the bank did mooch off taxpayers, then I’m much less sympathetic. P.P.S. Shifting to another topic, I like to share examples of how some nations enjoy faster growth than others, mostly because these comparison invariably help to show why small government and free markets are the best route to prosperity. 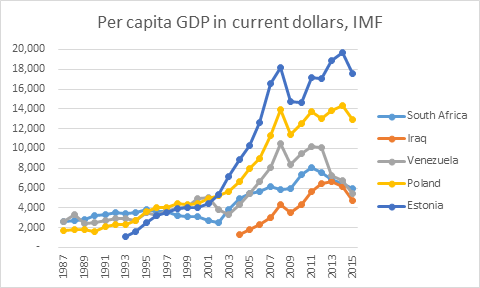 To echo this point, here’s a very enlightening chart I just saw on Twitter, which shows per-capita economic output for a group of nations that were all roughly equal back in 1997. What’s remarkable is that a couple of those nations dramatically boosted living standards in a very short period of time while others have stagnated. And since I’ve written about the good reforms in Estonia and Poland and complained about bad policy in Venezuela and South Africa, you can understand why this is yet another example of why leftists have no good response to my two-part challenge. Tax competition among states and municipalities promotes regressive taxes, and consequently, upward redistribution. Michigan gave homeowners a huge property tax cut, paid for with a higher sales tax and a new, steep tax on rental property. (The school property tax rate on rental property is 4 times the rate on owner-occupied primary residences.) Homeowners boasted about their tax cuts for a year, while every renter paid more. Tax competition is generally considered a good thing because there are usually more winners than losers, and also because the winners tend to have wealth and power, while the losers tend to be poor and powerless. say…, a pyridine shift in the economic and geopolitical realities… of a new emerging global civilization? last one to leave Europe… turn out the light? The first country to go to a real Fairtax will show the best economic gains by far. Greed of the political class? Haven’t you heard that “greed” has been redefined as wanting to keep your own money. Wanting to grab other people’s money is no longer greedy. Go figure.